The I Got Beet uses Ford’s Gin, beet simple syrup, lime juice and Peychaud’s for a savory cocktail with an almost shrub-like aftertaste. The base of Rumpkin Pie is Coruba Jamaican Dark Rum, and the carrot simple syrup with pumpkin pie spices, lemon juice and soda topper make for a lovely, just-short-of-sweet concoction perfect for pairing with any of the sausage dishes you see on the menu. But my favorite definitely was the Apple & Pork Festival, which singularly changed my mind about fat-washed cocktails – something I may have thought I’ve gotten over a year or so, ago. Laird’s Bonded Apple Jack is bacon fat-washed, then sweetened with maple syrup. But the Bitter Truth Celery Bitters, which are also used in the ice cube, as well as Jamaican #1 bitters, are fantastic finishing touches, offsetting the fatwash from the Laird’s and resulting in a delicious, smoky finish. If you’d like one of the classics (Old Fashioned, Manhattan, Gin Martini, Negroni), they’re available too; unfortunately, I didn’t try any of them so I can’t offer any recommendations on the aforementioned. If you’d like a New York Sour (red wine float) or a Boston Sour (egg white & lemon), you can choose from bourbon, rye, Irish, Cognac or gin as your base. 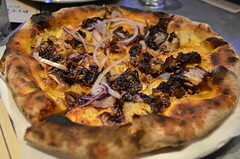 Also great was the Linguica Ragout, the sweet, spicy sausage of which you’ll also find on one of the fall pizzas, with pickled mustard seeds, cream, potato, radicchio and red onion. Chiles, slightly sour greens fill out this bouncy spaghetti dish, which also happens to employ a perfect sauce-to-pasta texture and ratio, a rare thing you’ll find with much of the other fast-casual pasta out there. 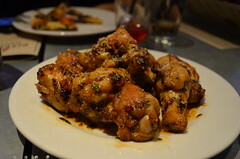 On the bar snack menu, you’ll find extremely addicting Oven Roasted Chicken Wings, with a slightly sweet & spicy dressing, that will accompany your cocktail just nicely. But just in case you’re in the mood to flesh out this wonderful, colder fall weather we’ve been having, Pitfire’s selection of fall topping combos are pretty hard to beat. There’s the Linguica Sausage pizza but also Roast Pumpkin, made with fontina cheese, greens, sage brown butter, pumpkin seeds and oil. 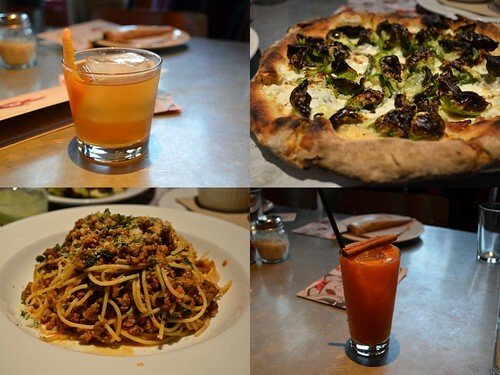 The Sprouts ‘n Bacon pizza is the realization of the Brussels explosion that happened awhile back and is here to stay. Mozzarella is at the base but furnished with whipped cream (what? well, it was subtle), chili, garlic and parmesan. So head on over to Pitfire. This awesomely chill weather beckons! This entry was posted in cocktails, Fairfax, Food, L.A., Mid-City West and tagged @pitfirelovesweho, @pitfirepizza, apple, autumn, bar snacks, beet, Boston sour, cocktails, Fairfax, fall, full bar, New York sour, pasta, Paul Hibler, Pitfire Pizza, pizza, pork, pumpkin, sour cocktails, sours, Tito's Vodka. Bookmark the permalink.